InterNations Izmir Love is in the Air Party! Since its February, let's spread the friendship along love in our official event! 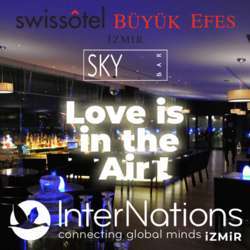 We are pleased to invite you to our InterNations Izmir Official Love Is In the Air February Official Event! Skybar-Swissotel Grand Efes will amaze your eyes with the perfect view and great drinks. Entrance fee includes Live DJ. We aim to enhance entertainment and friendship between the attendees. Please bring your energy love friendship and enthusiasm to the event. And also feel free to bring your international friends along, please invite them to http://www.Internations.org for registration. As this is one of the most popular places in İzmir, we have limited space. Therefore, we kindly request you to confirm your attendance by clicking the Attend button. Please don't forget to un-register if you find out later that you won’t be able to come. *Name list will be checked at the entrance by the venue and unlisted persons will not be taken in. *Dress code is business casual and smart casual. * We made a change and removed “Photo Shooting” for everyone. *All attendees are responsible for their own costs and all costs needs to be done directly to the venue. Please note: The entrance fees are used to keep the high standards of the InterNations Official Events and by doing so we are able to offer benefits such as; welcome drinks or entertainment programmes for our members.We are a team of volunteers, so all the benefit is used on the next Internations Event! Looking forward to seeing you at the official party!